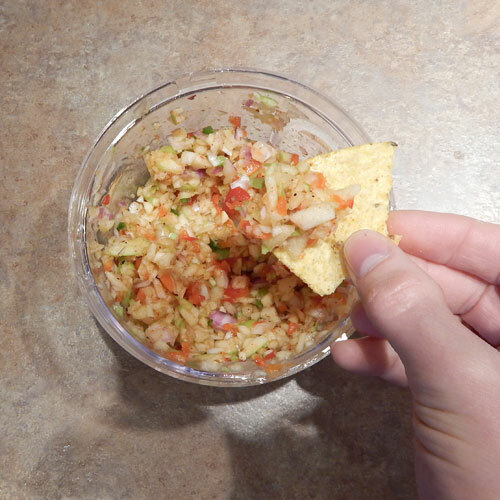 Apple Salsa is one of my favourite treats. I don’t make it often because of the time it takes to chop all the ingredients. 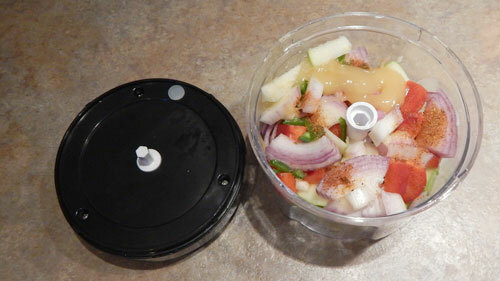 The “Cuisinart Manual Mini Food Processor” lets me chop, serve and store my salsa all in one convenient dish. 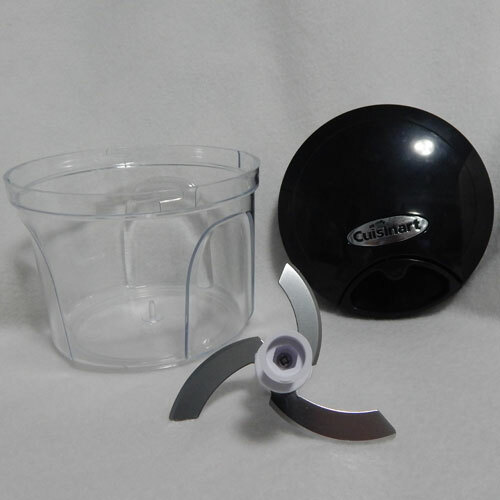 The “Cuisinart Manual Mini Food Processor” comes with the bowl, cover with pull-cord, blade and spatula. The bowl is 2.5 cup capacity and is dishwasher safe. I choose to hand-wash all parts of my chopper. It is easy to clean, just be careful you don’t accidentally break the little peg where the blade fits in. The blade for chopping has three blades at different tiers. There is a hole in the bottom to secure the blade in the cup. I wish there was a way to lock it on as I often knock it off when I’m adding my ingredients into the bowl. There is another hole in the top where the cover fits into. The lid locks on by sliding the tab into the notch. I like to chop my ingredients up into large cubes before I put them into the bowl. To chop your ingredients, simply use the pull-cord. The more you pull the cord the more finely chopped your ingredients become. If you don’t get the lid on correctly, it doesn’t chop. I find that it takes a couple pulls to get it started. Be sure to hold the bowl down tightly as you pull the cord so that it doesn’t flip over on you. When the food sticks to the side of the bowl, use the spatula to scrape the sides down. I often take the “lazy” way out and just pick the bowl up and shake it to move the stuck ingredients around. I use the chopper to chop up apples, onions and peppers. It works easily with minimal effort. No more tears when chopping onions. 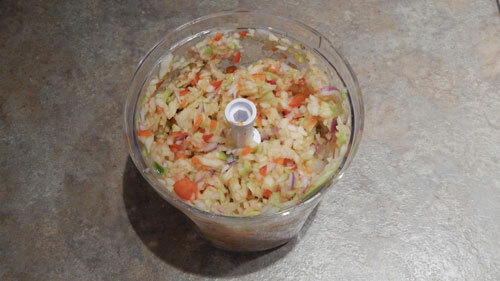 The bowl is clear so you can see how finely chopped your ingredients are. Pull out the blade and serve right in the bowl. This mini chopper is excellent to use for small portions. 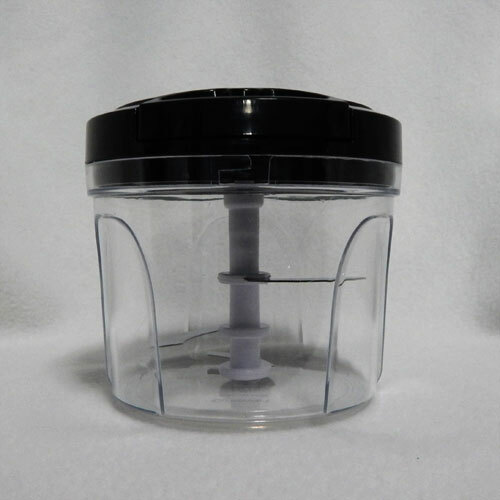 It is easy to clean and convenient to store. 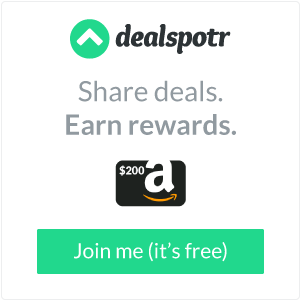 *Disclosure: I received a complimentary “Cuisinart Manual Mini Food Processor”: through the Amazon Vine Program in exchange for my review. All opinions are 100% my own.